At the end of the active breeding and family rearing season, long after the young falcons have left for their own adventures, the area around the nest box needs a good housekeeping visit. While the Peregrines are busy rearing their youngsters and giving them flying lessons, except for banding, we stay away from the nest area. Mostly this is to avoid disturbing the birds, but also for the safety of people as well as birds. Rebecca and Kewpee will defend their nest area, sometimes with little regard for their own safety (or mine). But, come fall, the camera lens needs cleaning, and a lot of ... hmm... leftovers have accumulated on the floor of the window well, threatening to clog the drain. Armed with a couple of trash bags, a garden trowel, and a hard hat, I am honored to tackle the most glamorous and esteemed job of a Peregrine steward. Unbeknown to me, Rebecca had just snagged some dinner and landed a floor above the nest box before I made my entry and interrupted the feast. 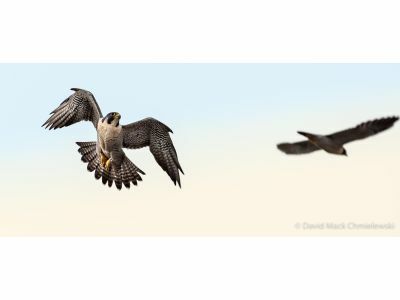 The falcons tend to shoot first, ask questions later, so there was an initial period of close flybys at incredibly high speed as you can see from the video clips. Rebecca did eventually settle down and land on the railing, and then on the parapet ledge to supervise the activity. When she landed, she was calm and we had a nice chat. The window well is over five feet deep, so you can only occasionally see the top of my hat because a) I am short and b) most of the time, I am on my hands and knees prying discarded leftovers and clumps of feathers off the floor. A short time later, the camera lens and the floor were both clean, at least for the time being. Dave C. got some great photos from the parking deck and we captured some good footage from the parapet cam, so check out the video archive and photo gallery.